Frontier Electronic Systems Manufacturing is ideally suited to the production of High Reliability and High Quality Aerospace and Military electronics. Utilizing both well-developed automated processes and highly trained assembly and test personnel, our Manufacturing team has won a reputation for quality hardware delivered on-time. Frontier Electronic Systems Manufacturing and Materials are the turn-key solution to both new-design and build-to-print products. Material is ordered from qualified vendors who have been screened and accepted to Frontier Electronic Systems’ Approved Supplier Listing. A robust set of Material Handling processes guide inspection, acceptance, and stocking of each item. The kitting process ensures that the correct parts are in the kit. Assembly utilizes work instructions and routers developed by Frontier Electronic Systems Manufacturing Engineering to accurately build and route hardware through the process; the automated processes include both Surface Mount Technology and Selective Soldering. Hand assemblers are trained to J-STD-001E and NASA 8739.1-4, in addition to many internal and customer processes. Both sophisticated test suites and environmental equipment are available to ensure that completed products meet all customer requirements. FES recognizes the trust placed with us by our customers to provide products that meet all specifications and perform reliably every time. Built in the detailed and exacting manufacturing processes are numerous checks of the product to ensure that result. It all begins with highly trained operators/inspectors who visually monitor their own work and inspect that of their co-workers. We believe that our people are the key to our success, and we ensure they have the tools and enviroment necessary to face the complexities of our various processes and technologies. Our Automated Optical Inspection system is programmed to compare a known good board to one that is in process, to insure that all parts placements are accurate and complete. The Fine-Focus X-ray is used to verify hidden solder joints, most specifically on Ball Grid Arrays (BGA) and complex thru-hole connectors. 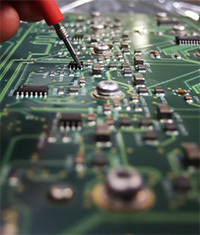 It is also programmable, to insure that no hidden solder connections are missed on complex assemblies. The DIT-MCO Cable Tester verifies continuity/discontinuity, insulation resistance and dielectric breakdown of cables and harnesses.